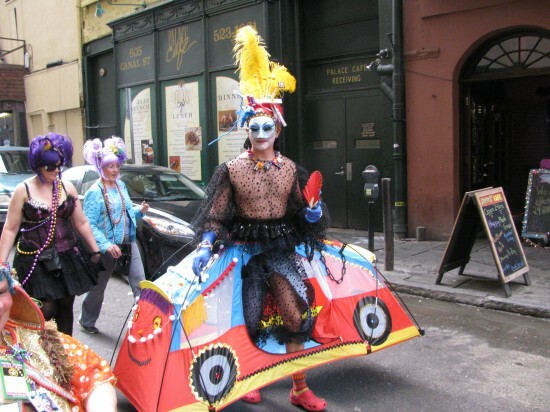 You see all sort of things on Mardi Gras Day. 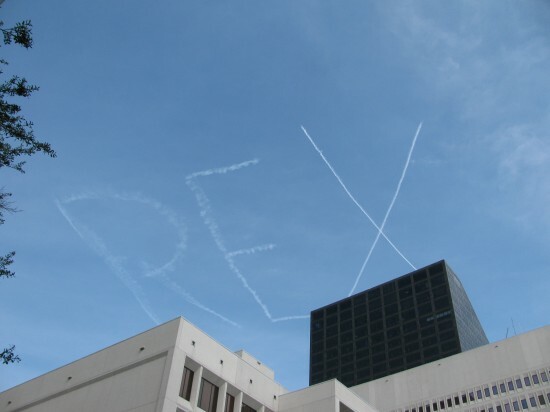 REX just finished being written by a skywriter, seen walking on Camp Street heading toward Canal Street Downtown. Rex is the King Of Carnival, the Lord of Misrule for the day. I did not see Rex himself this day, i was a bit late on getting over to St. Charles Avenue due to chasing Indians, see previous posts for that. Behind me is Lafayette Square and across St. Charles Avenue is Gallier Hall, where Rex greets his Queen. Rex had already passed by here by the time i got there and was probably seeing his tribute in the sky as he headed down Canal Street toward the Mississippi River. 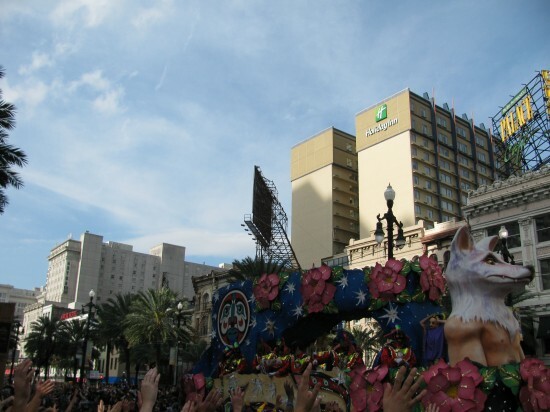 The one float picture i took, spent the rest of the time talking to folks from Uptown, Downtown and outtatown as the parade passed on Canal Street…hands held up like everybody else in the picture. This year i noticed something different i hadn’t seen before, Rex heading toward the river on the Uptown side of Canal Street. Every other time i’d seen Rex on Canal, the route was on the Downtown side of the street. Thinking about this later, i figured it was a crowd control measure. As soon as the parade passes, the barricades are opened and a flood of people head into the French Quarter. Having the neutral ground(where the street cars run, and the whole of 3 lanes of the street on the Downtown side allows for less of a crush of humanity heading into the Quarter. 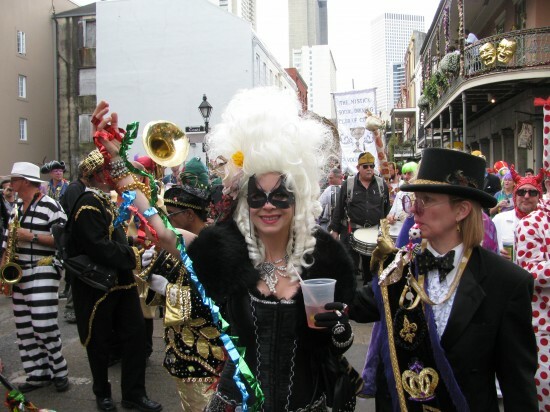 Nikki, as Marie Antoinette, sez “let them eat King Cake!” as the band director of the Storyville Stompers et al, looks on. 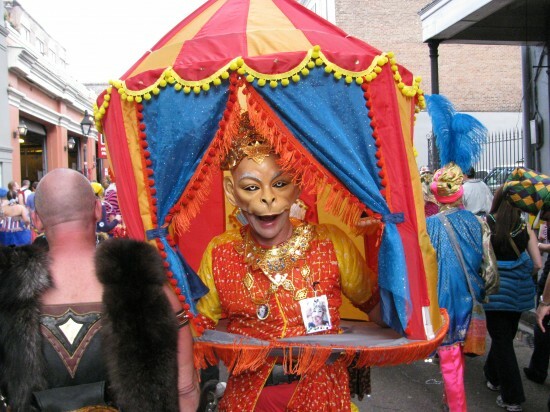 I concur with the let them eat King Cake sentiment, that would come later…..
A what i think is a Hindu Monkey God costume. You’ll notice he’s wearing picture on his left chest. 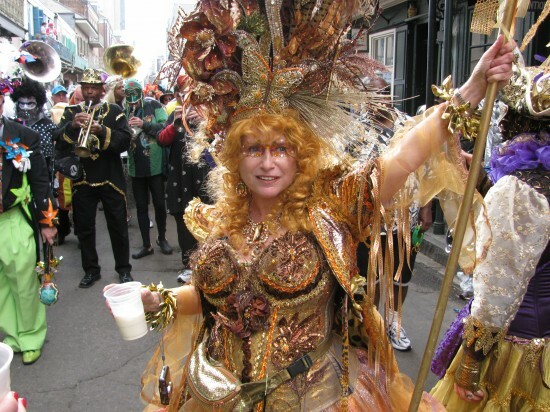 I looked and noticed it was Gloria Powers, a personal friend of mine, as well as friend and mentor to many in the New Orleans music community who had died a week or so before Mardi Gras. I was upset that i did not get to make her memorial service, held on the preceeding Friday, same day as our parade here in Baton Rouge. A couple of other folks were wearing tributes to her in the Society of St. Ann. I knew i was in the right place with the right group. 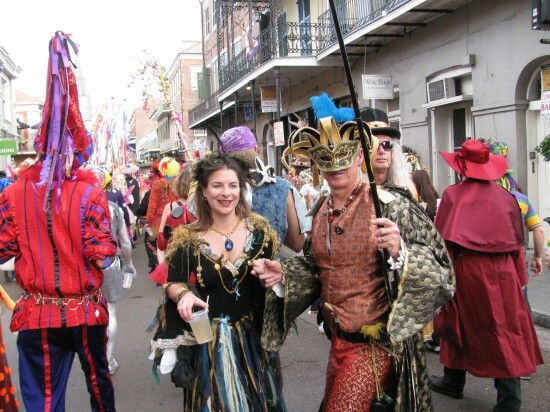 Will and Mary, the King and Queen of our Baton Rouge Krewe of Southdowns this year, mask in the Venetian tradition. 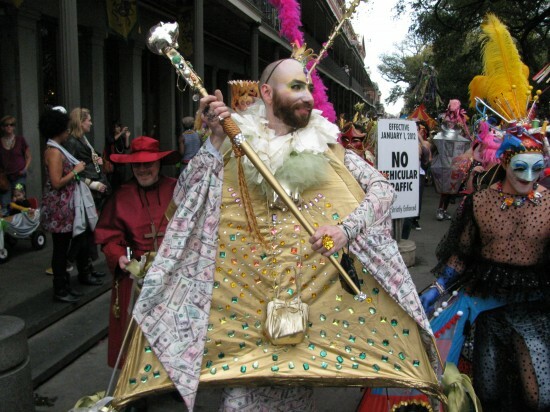 The guy on the left with his back to you is dressed in a Cajun Mardi Gras costume, in the original French tradition where the peasants would mock the royalty with pointed hats. The group leaves the Pontalba Apartments for destinations of their own. Bill decides it’s time to head for home, close to 10hours on the street, most of them on the feet, which were aching a bit as well as the legs. Got in the car 12 hours after leaving home for the ride back. 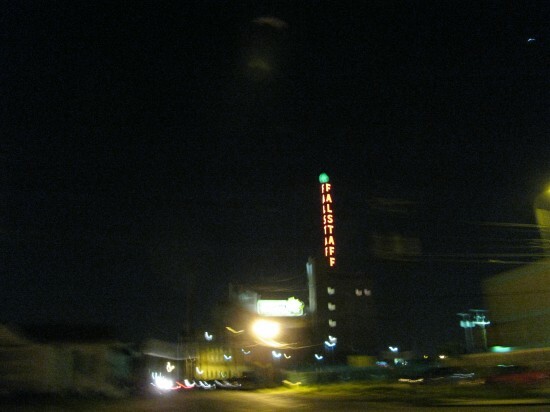 I thought about going by a gig put on by a friend of mine but decided that the traffic going that general direction was too much to deal with, so i headed out Tulane Avenue aka Highway 61(Revisited). Even though Falstaff beer is no longer brewed, the sign was revamped and lights up every night. Here it is on a drive by. I’ve been meaning to get a better picture of it and will do one day….consider this your neon for this post. 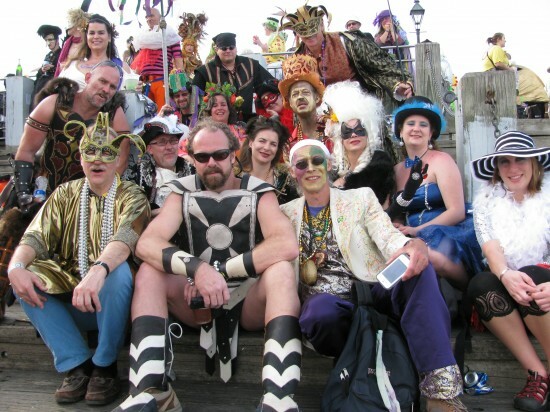 What can i say other than i and everyone i know had a fine time this Mardi Gras Day. Y’all should make the trip one of these days, i can show ya how it’s done……..
A skywriting entrance is always good!! As always, I love these reporting posts of yours. And I always love how happy everyone looks and how completely insane, In the wonderful sense of the word, those costumes are, and I wonder why every city doesn’t have some version of this to cheer its citizens up. I really love how you colored your face. So shimmy! Thanks very much for the comments. Just trying to take y’all there vicariously so to speak. Yes, Allee, every city should have something like this for the folks as pretty much every town in South La. does to different degrees during the season. 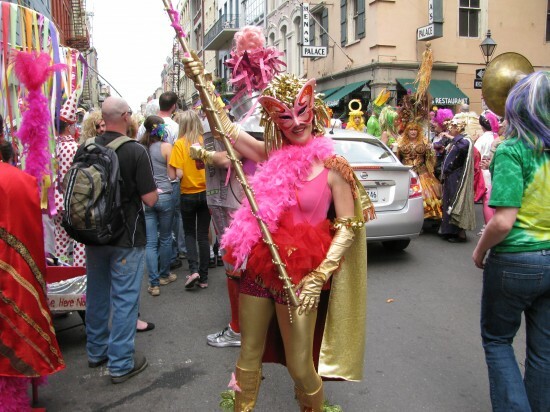 I recently told someone i know who has been to New Orleans, though not for Mardi Gras, that you can be in the city any of the other 364 days of the year, Mardi Gras day has it’s own feel, energy and vibe unlike any other day of the year. Ya gotta have some fun in your life, and like Dave Bartholemew sez in one of his songs “it doesn’t cost a single dime”…well other than the $20 it cost me to park the car and that was my total monetary expenditure for the day. 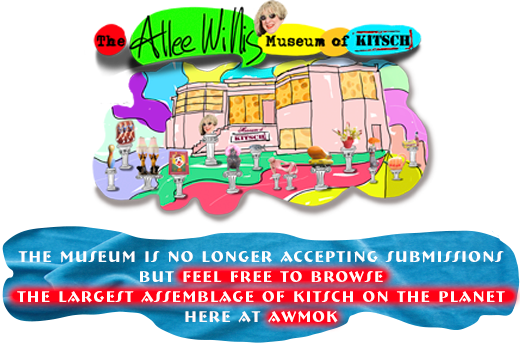 Come on down and live a little, just make sure your legs are in shape for walking.